The Packers have a 2-5-1 record since quarterback Aaron Rodgers fractured his left collarbone on Nov. 4. GREEN BAY, Wis. — When Green Bay Packers coach Mike McCarthy walked into the team meeting at 8:05 Thursday morning, he shared a much-anticipated announcement with the players: Aaron Rodgers will be the starting quarterback Sunday against the Chicago Bears. It was an informative message and nothing more. McCarthy didn’t want to make a big deal out of it. Sure, Packers fans have been waiting for this news since Rodgers fractured his left collarbone on Nov. 4, but with Green Bay’s win-and-they’re-in game quickly approaching, any distraction — even a positive one — would have been unwelcome. "Our guys, and maybe it’s because of the guy standing in front of them, they don’t react very much when I’m up there," McCarthy said when asked of the scene that unfolded at the time. "I don’t know if it’s my dynamic vocabulary or things like that. "It was business as usual. We’re focused on, this is a football game — we’re not putting this all on Aaron’s shoulders." It was in that same meeting that Rodgers found out he would be the starter. He wasn’t told separately. Rodgers was made aware of the decision at the same time as his teammates. "The scene?," Rodgers replied when asked how players reacted. "We were sitting in the team room and he (McCarthy) told us. That was the scene." Considering the Packers had a 2-5-1 record during Rodgers’ absence and yet still have a chance to win the NFC North, some might expect the natural reaction to be more celebratory. But nope. It was treated as just another piece of information. "There wasn’t no cheering," wide receiver James Jones said. "Everybody was trying to get on with the meetings. Everybody knows how big this game is. We’ve got the best player on our team back in, but just because he’s playing don’t guarantee nothing. We’ve still got to go out there and play football, play it a high level in all three phases and we’ve got to win. And he knows that. Nothing’s guaranteed. Everybody gets paid around this league, so we’ve got to go out there and win the ball game." Perhaps the lack of jubilation was due to players already having the general feeling Rodgers was going to play. "When (McCarthy) told us this morning, we had an idea based on what was going on throughout the week," wide receiver Jordy Nelson said. "I was hoping it would be him, but when he told us this morning, everyone didn’t throw their hats up in the air and jump up and down. It’s business. We expect (Rodgers) to come back whenever he was healthy. I guess it’s now, we look forward to having him back out there and the opportunity to go out and make plays." While no one in the room was outwardly excited by Rodgers’ return, it’s safe to assume that every player felt as if their chances to beat the Bears were now significantly greater. "Best player on our team, (so) it’s huge," Jones said. "He’s the $100 million man for a reason. He’s probably the most important guy on this team, so we’re glad to have him back." All eyes will be on Rodgers’ every move Sunday. Will he be rusty after a nearly eight-week absence? If he gets hit near his left collarbone, how will Rodgers’ body react? Could playing in this game potentially make the situation worse for him if he falls on it? 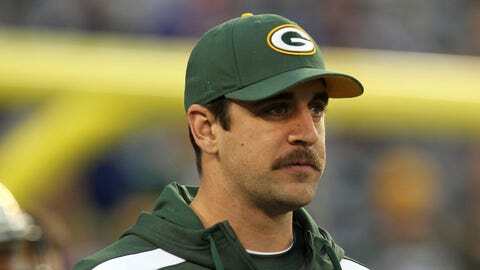 Will Rodgers be quicker to throw the ball away in an effort to not absorb any blows from oncoming Bears defenders? Rodgers said he’ll be trying to "block that out" when he takes the field in Chicago, but it remains among the bigger questions heading into a game in which the division will be decided. For one day, though, Rodgers was just happy to get the news he’s so desperately been wanting to hear. "I know they’re excited about my return, but I think that the way they believe in me and the expectations they have in me, I have the same ones for them," Rodgers said. "I believe in them and have expectations that they’re going to play well. "My coming back doesn’t mask over any of that or doesn’t alleviate pressure on the guys. I think the pressure that we put on ourselves we can harness at this point and see how good we can really be."